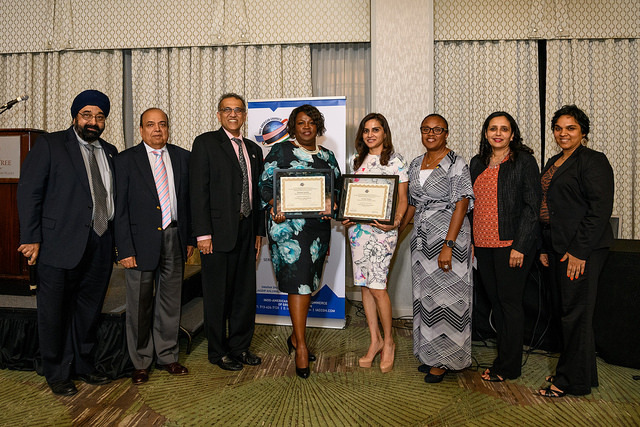 The Indo American Chamber of Commerce of Greater Houston held its final Women Mean Business series for the year on October 30th, ending a successful 2018 with yet another successful event. The Keynote Speakers for the event were Vanitha Pothuri & and Nyamusi Igambi. President Swapan Dhairyawan, welcomed the gathering by encouraging the audience to stay connected with the Chamber, which will be celebrating its 20th anniversary next year. He also shared a few details about the upcoming Trade Mission to India led by Houston Mayor Sylvester Turner and the Greater Houston Partnership. Executive Director Jagdip Ahluwalia, thanked SHELL, the sponsor for the event, for their generous support to both the Women Mean Business and the Distinguished Lecture Series. Past President and Program Chair Joya Shukla introduced the Keynote Speakers and encouraged the audience to share their ideas on the different kinds of successful women leaders they would like to hear and learn from. Vanitha Pothuri spoke about how her work ethic and interest to run a business came from her parents. Those traits, she said, helped her to begin an entrepreneurial venture, starting in retail and venturing into “the gelato and cookie business”. She also shared the various challenges she faced and lessons she had to learn on the way to establishing her franchise. “The path to success is to keep aside your ego and to always be ready to learn the core principles and concepts”. These ideals, she said, helped her to equally juggle being a doctor and a food entrepreneur. Nyamusi Igambi shared that she has come to a full circle moment being back in Houston; the city where she started working with the U.S Commercial Service 18 years ago and currently serving as its Director. Her multicultural family background fostered the curiosity to seek multicultural and diverse spaces, both personally and professionally. She also shared the exposure and knowledge she gained through her travels to countries like Colombia, Mexico, Nigeria, India and within the USA. She closed her speech by encouraging women to “Keep showing up, keep asking questions, to mentor and raise the next generation of leader”. Following an engaging Q&A session, Shell representative and IACCGH Board member Alyssa Holmes Henderson, presented the gifts and certificates to our speakers.